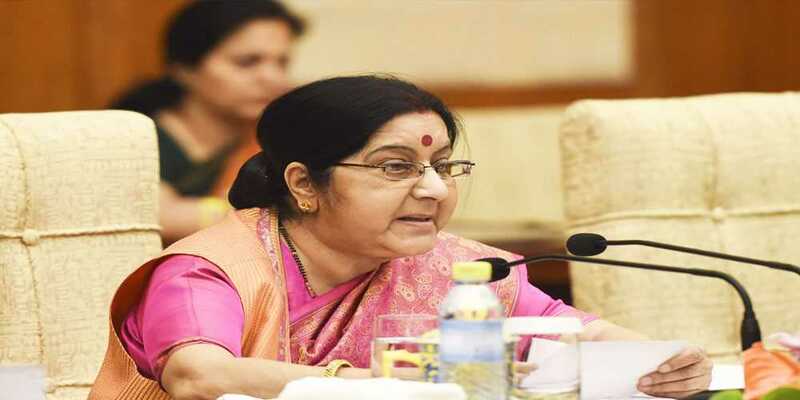 Hours before the groundbreaking of the corridor in Pakistan’s Narowal district, Indian Minister for External Affairs Sushma Swaraj on Wednesday said the Kartarpur corridor initiative is not connected with the dialogue process with Pakistan. Addressing a press conference earlier today, the minister thanked Pakistan for accepting India’s longstanding demand for opening of the Kartarpur corridor, but clarified that it does not mean that bilateral talks will begin soon. A delegation from India reached Lahore via the Wagah Border earlier to attend the groundbreaking. The delegation comprises Minister for Food Harsimrat Kaur Badal and Minister for Housing Hardeep S Puri. Indian cricketer-turned-politician Navjot Singh Sidhu is also in Pakistan for the event in his personal capacity. “Bilateral dialogue and Kartarpur corridor are two different things. I am very happy that for the last 20 years, rather many years, government of India has been asking for this Kartarpur corridor. And for the first time, Pakistan has responded positively to this,” Swaraj was quoted as saying by Indian media. “But this does not mean that the bilateral dialogue will start only on this,” she added.